Bay was designated by the Herb Society of America as 2009 Herb of the Year. 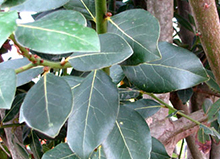 The familiar and important cultivar laurus nobilis, often called Sweet Bay, is the member of the bay family with which most of us are acquainted. 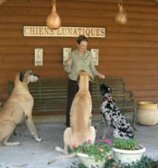 A native of the Mediterranean area, bay is well-suited to our mild temperatures and doesn?t seem to be bothered by Texas heat and humidity. Some bay trees in this region attain heights of 25 to 30 feet, but modest heights are probably more realistic. It has a dense and rather shrubby growth habit and beautiful glossy green leaves. Bay grows slowly and hence is a challenge to propagators. Starting with a well-rooted small plant is recommended for best results. It needs good drainage and some filtering of hot summer afternoon sun. Bay can be grown in a container using ordinary potting soil and moved into the garden when it reaches 3 to 4 feet in height. In the garden, limbing the bay tree up allows for herbs and flowers to be planted around its base. Bay leaf is an important seasoning in many homey dishes likes soups, stews, and gumbos; many recipes have been published this year in which bay leaves are used in desserts as well. Fresh bay is preferred by most cooks who have access to it, although it is always available in dried forms. Bay forms a beautiful foundation for wreaths of all kinds, and it?s hard to imagine a potpourri without it. Although most herbs have interesting histories, the appearance of laurus nobilis wreaths on the brows of Greek champions, sculpted in marble, are icons of Western civilization and thus reside in our memories of school days past.